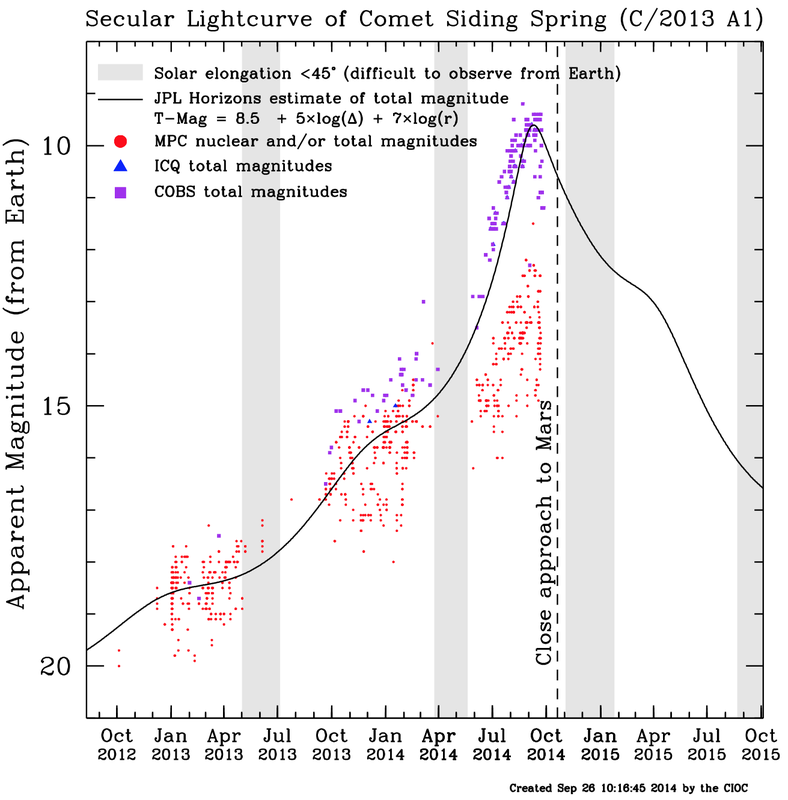 The latest light-curve for Comet C/2013 A1 (Siding Spring). If you looked at the current lightcurve and wondered why all the points are suddenly below the black line, you’re not alone. We’ve had some very good discussions amongst various members of the CIOC and a few colleagues trying to decide what to make of it and not come to any conclusions ourselves. As Comet ISON demonstrated repeatedly last year, comets can be highly unpredictable, especially when on their first pass through the inner solar system like our beloved comet Siding Spring. Thus, the downward trend of data points over the past few days could be significant, or it might be nothing at all. We try to limit what we post here to facts and avoid speculating, so we are not going to get into possible explanations for the sudden decrease (or for that matter, try to rationalize it away). Instead, we will use this opportunity to remind readers that science is rarely “instant” – we record our observations and measurements then look for answers to explain what we saw. Right now we are very much in the “record our observations” stage for comet Siding Spring, so we all need a bit of patience before we can hope to understand what is going on with the comet. Fortunately, comet Siding Spring is a very popular object right now, and there are a wealth of observations planned over the next month. We will share results from these observations as we are made aware of them and will, of course, continue to update this plot regularly. We plot three sources of data. The first, shown as red circles, are the magnitude measurements being reported by the Minor Planet Center. These measurements vary widely from observer to observer based on each person’s technique and instrumentation. Most are only measuring a relatively small region near the comet, yielding a fainter brightness than if they measured the whole coma. So you should expect to see fairly significant scatter within these data points. The second, plotted as purple squares, are from the Comet Observations Database. The COBS data are generally “total magnitude” estimates that try to encompass all of the light from the comet. Many of these estimates are made by very experienced observers using binoculars or even their naked eye who compare the comet to nearby stars of known brightness. It takes a lot of work to be good at this technique, but as you can see from the relatively small scatter in the points, yields quite reliable estimates. The third kind, plotted as blue triangles, are from the International Comet Quarterly. This data is recorded in much the same way as that archived by the COBS.